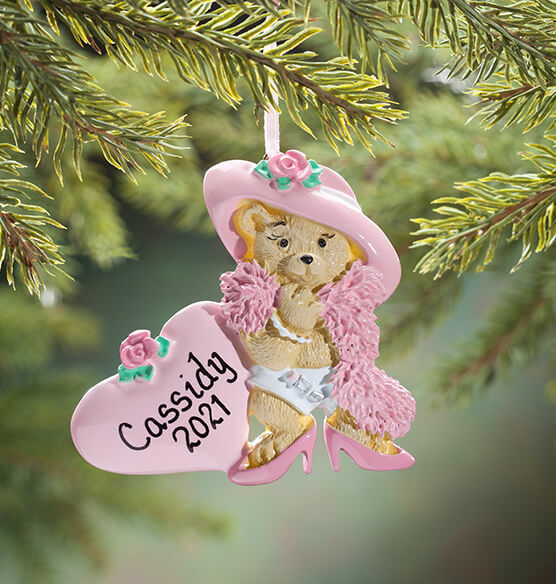 Donning Mom’s heels and hat with a fancy pink wrap, this personalized Dress Up bear ornament is adorably accessorized and fashionably personalized! A fun, thoughtful gift for your little glamour girl, her pretty pink heart will be personalized with name and year. Specify name; limit 1 line, 10 letters/spaces. Specify year; limit 4 characters. Resin. Personalized Christmas ornament measures 3 1/2" long x 3 1/2" wide.